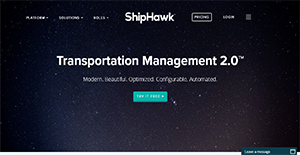 ShipHawk is an enterprise TMS with a modern design and a configurable interface. The application serves to automate various steps in the transportation and shipping process to enable businesses to reduce costs and to get more done in a day. With ShipHawk, companies can also gauge whether or not they are performing as well as they wish to. They are able to do this with the reporting feature of the application which they can use to assess various aspects of the business. They can utilize insights from such reports to fine-tune their operations. ShipHawk also has a wide variety of integrations. The software supports connections with various systems, making it a dynamic, customizable, and functional application. ShipHawk enhances the shipping process by optimizing the supply chains. This leads to a reduction of shipping and fulfilling time, hence the costs in both areas are also cut. Not only can the company save both time and money, they can also deliver a great customer experience. ShipHawk also comes with an intuitive dashboard, where shipping managers are able to view and control processes from start to finish. ShipHawk comes with standard reports that provide helpful insights into a company’s operations. These serve to let business owners know whether or not they are at their optimum production level so that they can lay down plans to remedy it if that is the case. With ShipHawk, companies can afford a great experience to their customers. They can do this with various features embedded in the application’s interface such as on-demand pricing, order status tracking and notifications, and more. This way, customers enjoy their transactions with the brand and let them consider the business for future dealings. ShipHawk enables businesses to expand the use of the application through its integrations. The software supports bi-directional connections with various systems for companies to conduct numerous tasks from one place without having to switch between several windows or tabs. This ensures that data relay is seamless and the information transferred remain accurate. It is essential to keep in mind that virtually no software in the Sales Software category will be a perfect solution able to meet all the needs of all company types, sizes and industries. It may be a good idea to read a few ShipHawk reviews first as some solutions may dominate only in a very small set of applications or be prepared with a really specific industry in mind. Others may operate with an intention of being simple and intuitive and consequently lack advanced elements desired by more experienced users. There are also software that focus on a wide group of customers and provide a complex feature set, however that usually comes at a higher cost of such a solution. Make sure you're aware of your needs so that you purchase a service that offers specifically the functionalities you search for. How Much Does ShipHawk Cost? We realize that when you make a decision to buy Sales Software it’s important not only to see how experts evaluate it in their reviews, but also to find out if the real people and companies that buy it are actually satisfied with the product. That’s why we’ve created our behavior-based Customer Satisfaction Algorithm™ that gathers customer reviews, comments and ShipHawk reviews across a wide range of social media sites. The data is then presented in an easy to digest form showing how many people had positive and negative experience with ShipHawk. With that information at hand you should be equipped to make an informed buying decision that you won’t regret. What are ShipHawk pricing details? What integrations are available for ShipHawk? If you need more information about ShipHawk or you simply have a question let us know what you need and we’ll forward your request directly to the vendor.